William Bonson was born about 1773, died on 3 Jan 1823 in Hoxton, London, about age 50, and was buried on 10 Jan 1823 in St Leonards Churchyard Shoreditch London. His first marriage was to Mary Taylor (born Healey), widow, of the parish of St Leonards by banns 11th June 1798 at the age of 25, in the presence of William Windsor and Sarah Healey. Both the witnesses and the bride and groom made their mark. They had 5 children in 10 years. 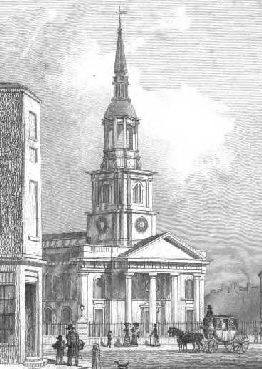 Her previous marriage had been to James TAYLOR on 1 Apr 1793 at Spitalfields Christ Church, Stepney, London.. He was described as an Exciseman - working to collect tax. Elisabeth Bonson was born in Feb 1799 and was christened on 24 Feb 1799 in St Leonards, Shoreditch, London. 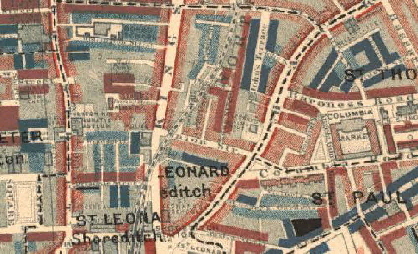 David Bonson was born Jun 1802 and was christened on 11 Jun 1802 in St Leonards, Shoreditch, London. Mary Ann Bonson was born by Oct 1808 and was christened on 9 Oct 1808 in St Leonards, Shoreditch, London. Lucy Bonson was born by Oct 1808 and was christened on 9 Oct 1808 in St Leonards, Shoreditch, London. Eliza Bonson was born by Oct 1808 and was christened on 9 Oct 1808 in St Leonards, Shoreditch, London. William next married Ann Sumner, daughter of Joseph Sumner and Margaret, on 26 Jul 1813 in St Leonards, Shoreditch, London by banns in the presence of Elizabeth Rockwell & Mary Sumner to Ann Rockwell. She was described as a widow and he was a widower. Ann signed, William made his mark. 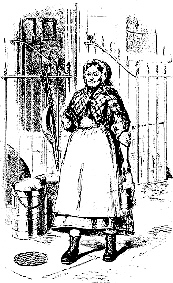 She was born in Eastwick in Hertfordshire, and was first married on 8th May 1802 to John Rockwell a customs and exciseman at St Gorges, Hannover Square, in London. Both were able to sign the register. She was approximately 27 years old. They had at least one child, John Henry who was 7 when his mother remarried. When she remarried in 1813 to William Bonson, she was about 38, he was about 40. William Bonson was born on 14 Jan 1816 in 21 Union Crescent, Hoxton, London and was christened on 7 Feb 1816 in St Leonards, Shoreditch, London. Abraham Bonson was born on 24 Sep 1818 in 21 Union Crescent, Hoxton, London, was christened on 14 Oct 1818 in St John The Baptist, Hoxton, London, died on 25 Dec 1862 in London, at age 44, and was buried in Nunhead Cemetary, New Cross, London. Ann Bonson was born in 1819 in Hoxton, London and was christened on 26 Sep 1819 in Shoreditch, St Leonards, London. 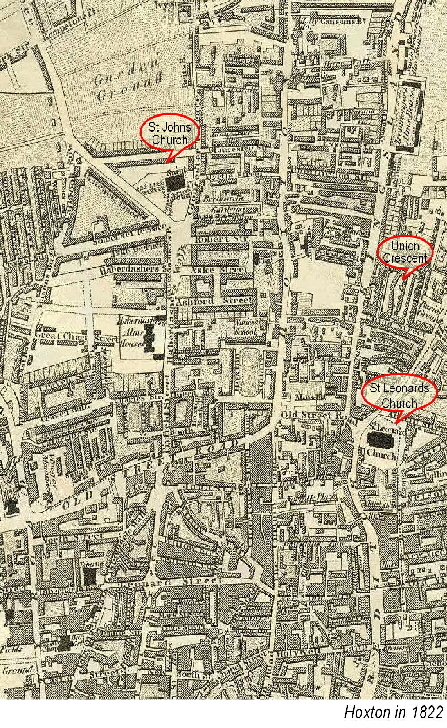 "Father died Jany 3rd 1823"
Whilst the burial records of St Leonards Church, Shoreditch record William Bonsons death in 1823 as a butcher, the 1816 and 1818 baptismal records of two of his children give his occupation as a milkman, which was also his widows occupation. "Mother died June 3rd 1852"